Wedding caterer, and my wife KNOW Southern cooking, so the wedding was fun, of course, but this little bottle made everyone 'take away' a great memory. Order extra since some will ask for a refill. Great as a party favor! Great wedding rehearsal dinner party favor for a Mexican dinner! The personalized labels and small cowboy hats were a wonderful addition too! We held a rehearsal dinner for our groom to be & his fiance'. We had a Mexican themed party with a grilled quesadilla station on site. The bottles of hot sauce hit the spot as favors! Have referred many others to your site. I purchased a case of this to use at my wedding and to put into the groomsmens gift bags. It arrived quickly (even to Canada) and the quality is great. the hot sauce tastes really good too. We have one extra and I look forward to using it!! Only downside is you have to apply the labels yourself, but it isn't that time consuming or difficult. Ordered these as favors for our son's rehearsal dinner. It's hard to find useful masculine party favors, but we think this was right on target. Haven't tasted the sauce itself, but other reviewers have given it a thumbs up, so I'm not worried. We're giving these away as guest wedding favors, and are thrilled with how unique and representative of us they are. We highly recommend this product, and would purchase them again. We combined this with the BBQ sauce for wedding favors. It was perfect because the theme for the food was a combination of the two grooms' cultures, Cajun and Texan. The bottle and the sauce was a great favor for the BBQ Engagement Party for my daughter. The labels were just OK. The sauce was great flavor. The hot sauce was excellent and the labels were very attractive. We used this as a favor for the rehearsal dinner and they were a great hit. The only negative comment is that the bottle needs a shaker top. Be careful when you pour. Love this product we are using for a shower and it is going great.. I Loved this product. We used them as our favors at our wedding. We had BBQ as the meal and this product went well with the theme. They were bigger them I taught, So now I understand why they were a little expensive. The labels gave them a nice personal touch, that we both loved. This product is also great for any occasion, it gives it that different touch, that sets you apart from all the special occasions you've been to. It was a great product. Had hot sauce and bbq sauce and guests were to choose one as a thank you gift. We used this hot sauce as one of our wedding favors. People LOVED them. We have been asked more than once since where people can buy more. The flavor is wonderful, and they are great for the cost. Excellent product! I am presenting one bottle to each couple attending the rehearsal dinner as a thank you token! "I would purchase this product again"
I would recommend over and over again! this product was much better than expected. The quality of the labels was outstanding! A unique wedding favor I would highly recommend! 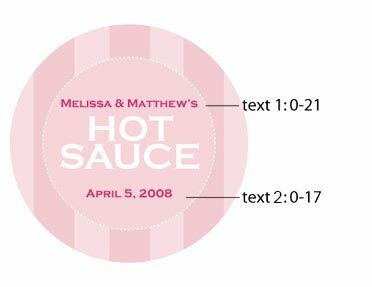 The personalized hot sauce bottle made a terrific wedding rehearsal dinner table favor. The dinner was held at a blues/barbecue bar/restaurant. I did not want a "wild west" or "south of the border" theme. 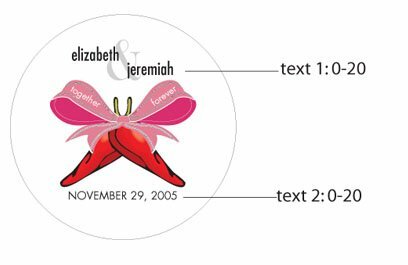 The personalized label "forever together" was perfect - simple, attractive, great design. I used the same label on packages of mints. Q:Is their an ingredient or nutritional label on back of bottles or an expiration date stamped on them? Expires in about 1 year, expiration listed on bottle. Q:What if I wanted it to read some like it hot rather then the choices available or say Forever Young? Is that possible? A:Unfortunately, this is not possible for the Hot Sauce Labels. Q:Do you know where the woven bags are available? A:We no longer carry that item. We do have item#: 1161, that would be similar to that item. Q:What is included in this order? Does it come with the weaved bag as shown in the picture? And what kind of assembly will be required besides putting on the labels? 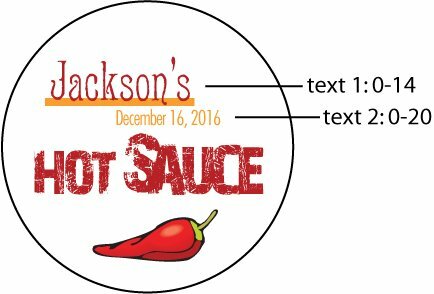 A:This item is for the hot sauce bottles and the personalized labels are optional and are sold separately. The bag and ribbon are no included. Minor assembly is required since the labels are not already on the bottles. Q:are the sauces made in the USA? where are they bottled? A:This item is made in the USA. They are bottled in Northern California. Q:what are the specs of your labels? A:These labels are 2" circles. Chili peppers represent the passion in passion foods, and every healthy marriage can use a little heat! Our gourmet hot sauce favors are perfect for spicing things up! Unique hot sauce recipe is created by award-winning head chef, Michael Orr of the elite Palo Alto Club. Taste can be described as having plenty of heat, but also full of flavor. Bottles come personalized with your own brand on our custom designed labels. Enter the couple's names and wedding date for a hot wedding favor, or come up with other sayings. 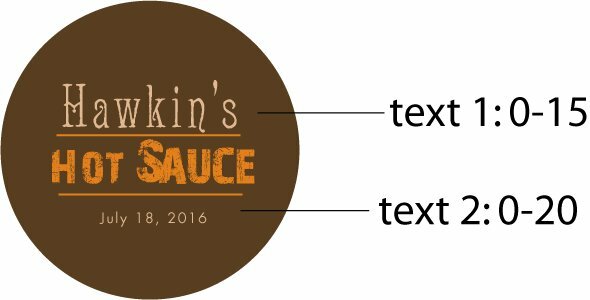 For a Western themed wedding, we also offer tasty personalized BBQ sauce. The 5 oz. bottles measures 6.5" in height and 1.75" in diameter. Please note that labels are shipped on sheets and some assembly is required. Hot sauce bottles are sold in cases of 12 bottles.